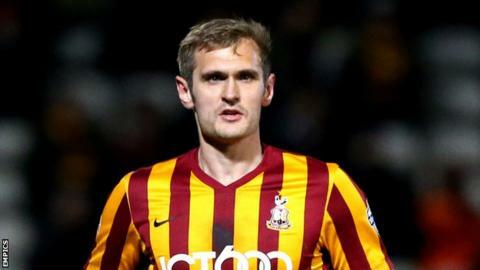 Bradford City striker James Hanson's first-half goal helped the Bantams come from behind to claim a point against Fleetwood Town. Fleetwood took the lead within three minutes when Jimmy Ryan's free-kick flew over visiting keeper Ben Williams. But Bradford countered and drew level when Josh Morris crossed for Hanson to coolly finish past Chris Maxwell. The visitors thought they had won it deep into added time but Steven Davies' header was judged to be offside. Match ends, Fleetwood Town 1, Bradford City 1. Second Half ends, Fleetwood Town 1, Bradford City 1. Lee Evans (Bradford City) is shown the yellow card. Danny Andrew (Fleetwood Town) is shown the yellow card. Lee Evans (Bradford City) wins a free kick in the defensive half. Paul Anderson (Bradford City) wins a free kick in the defensive half. Bobby Grant (Fleetwood Town) wins a free kick on the left wing. Substitution, Bradford City. Steve Davies replaces Devante Cole. Substitution, Bradford City. Lee Evans replaces Billy Knott. Jimmy Ryan (Fleetwood Town) wins a free kick in the defensive half. Foul by Josh Morris (Bradford City). Corner, Fleetwood Town. Conceded by Rory McArdle. Substitution, Fleetwood Town. Jack Sowerby replaces Jamie Proctor. Attempt missed. James Hanson (Bradford City) header from the left side of the six yard box is just a bit too high. Devante Cole (Bradford City) wins a free kick in the attacking half. Substitution, Bradford City. Paul Anderson replaces Mark Marshall. Attempt missed. Bobby Grant (Fleetwood Town) left footed shot from outside the box is high and wide to the left. Attempt saved. Bobby Grant (Fleetwood Town) left footed shot from a difficult angle and long range on the right is saved in the bottom right corner. Attempt missed. Jamille Matt (Fleetwood Town) header from the centre of the box is just a bit too high. Victor Nirennold (Fleetwood Town) wins a free kick in the attacking half. Delay in match Reece Burke (Bradford City) because of an injury. Attempt saved. Jamille Matt (Fleetwood Town) left footed shot from the centre of the box is saved in the top centre of the goal. Corner, Fleetwood Town. Conceded by James Meredith. Attempt blocked. Tyler Hornby-Forbes (Fleetwood Town) right footed shot from the right side of the box is blocked. Devante Cole (Bradford City) hits the left post with a right footed shot from the right side of the six yard box. Mark Marshall (Bradford City) wins a free kick in the defensive half. Attempt missed. Devante Cole (Bradford City) right footed shot from outside the box is high and wide to the right. Substitution, Fleetwood Town. Bobby Grant replaces Lyle Della Verde.